Indian Oil has been branded this scheme as 'Fuel @ Doorstep'. Residents of 38 more cities would soon be able to have diesel delivered at their doorstep as the three oil marketing companies (OMCs) plan to extend this service by March. Indian Oil Corporation (IOC), Bharat Petroleum Corporation Ltd (BPCL) and Hindustan Petroleum Corporation Ltd (HPCL) are providing home delivery of diesel in nine cities — Pune, Delhi, Jaunpur, Chennai, Bengaluru, Aligarh, Rewari, Udaipur and Navi Mumbai. “By the end of January, we will be having this facility in eight more cities and will extend it to 30 more cities by March 31,” said an official close to the development. Home delivery of diesel had kicked off in Pune on March 16 last year. Among the cities with this facility, Navi Mumbai has the largest sales of 150 kilo litre a month while sales in other cities are at an average 40-50 kl per month. “The move helps large fleets of commercial vehicles as it saves both time and money for the fleet owners,” he added. The customer should buy a minimum of 200 litres at a time. However, the petroleum and explosives safety organisation is yet to give clearance for the supply of petrol to homes, owing to its inflammable nature. Firms supply diesel to homes using small tankers that has been retrofitted with a fuel dispenser. Based on the existing norms, any customer ordering more than 2,500 litres will need a clearance from PESO for storage. IndianOil has been branded this scheme as ‘Fuel @ Doorstep’. Based on data available with the Petroleum Planning and Analysis Cell (PPAC), diesel consumption increased 3.5 per cent in December 2018 and recorded sales of 7.4 million tonne as compared to 7.1 MT in December 2017. On a cumulative basis, a growth of 2.6 per cent was recorded for the April to December 2018 period as compared to the same period last year. Diesel sales saw a 6.6 per cent rise to 81.073 MT during 2017-18 against 76.027 MT in 2016-17. Production of petroleum products during December 2018 saw a de-growth of 4.8 per cent over December 2017. 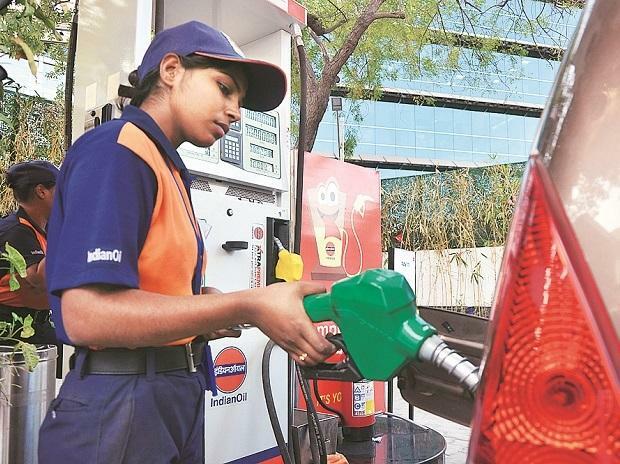 A committee headed by economist Kirit Parikh is in the process of reviewing the current marketing guidelines to pave the way for more private participation in the fuel retail sector. Though the idea of setting up the committee was to remove the entry barriers in the retail industry, sources indicate that it may also consider ideas related to innovative marketing models like selling petrol and diesel through the nearest hypermarket, similar to those in the UK and France. Based on media reports, supermarket players including Tesco, Sainsbury, Asda and Morrison account for over 45 per cent of the total fuel sales in the UK. This idea, along with a series of innovative models in retail, will be under consideration of the panel. Currently, India has around 64,050 fuel retail outlets, out of which 27,459 are run by IOC, 14,651 by BPCL and 15,357 by HPCL. Among private players, the major players are Nayara Energy with 5,033 outlets, Mukesh Ambani-led Reliance Industries running 1,400 outlets and Shell with 144. There are also minor players that have as little as six outlets.